Site maps are very important for any website or blog .After giving your blog/website the best design and making it life, we sometimes feel the deal is done. We are aware that most websites designed today take into consideration SEO. 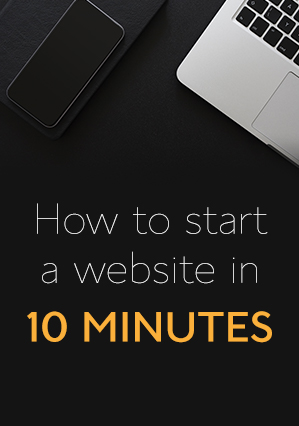 Designing your blog and hosting it does make it 100 percent complete. People need to know about what you offer on your blog, you services, post and products when they search on Google, Bing, Yandex and other search engines. Among the several factors needed to optimize your site. Creating site maps and submitting them to Bing and Google are very important especially to those who want to optimize their content (bloggers in particular). Basically, a site map is a search engine informer. It informs search engine about the latest updates on your website. Blogger blogs by default have an XML site map generator. You don’t need to do anything for your site maps to be generated. There are generated automatically. 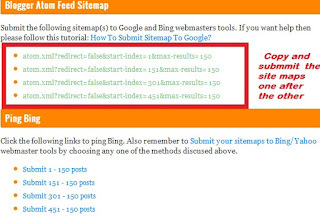 Submit this second site map to Google and proceed to the next 500 by replacing 1 with 1001 this time around till you have exhausted the post on your blog. 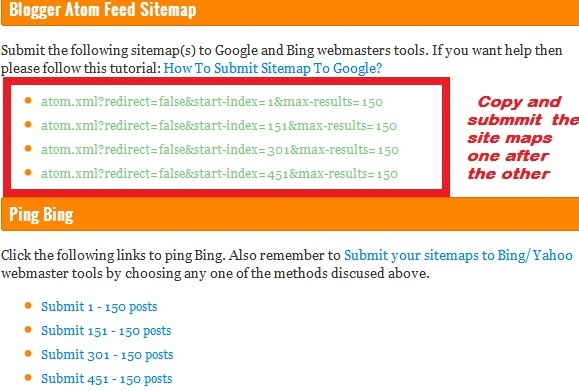 In order to submit to Bing add your domain name to form a site map link as follows. Remember to replace ransbiz.com with your domain name . Copy all the code (indicated in the rectangle with red borders) to note pad. As you can see, the code looks like the one above. The difference is that each site map has a maximum of 150 posts. So you will submit it in a similar manner as we did above one above. The simplest way to generate site maps for word press blogs is with the help of plugins. There are several plugins that can do this Job. I will suggest these two. All you have to do is down and install the plugin of your choice. ----click on the start button and wait for your site map to be generated. ---Download your site map or request download link via email and upload it to Google, Bing, Yahoo or any other search engine. STEP3: Click on generate site map. STEP4: Click on more to add other options or modifications to your site map. Get your site map(s) and submit to search engines. You can submit up to 2000 post by this method. Here are the various ways to generate or create site maps for your blogs or website. Do you know any simple method to generate a site map or any online site map generator? we will be happy if you share it in the comment section. Good day! I read your article and learn about it. Thanks for sharing your expertise and information about this study. I also have a site imarksweb.net ,kindly open if you have time :) Thanks.